The history of Britain after the Second World War is essentially the story of her loss of great power status. Writers discussing this decline often focus on those sources of power which are tangible and capable of measurement: the size of a country’s armed forces, her Gross Domestic Product, or her energy reserves. But there are other real sources of power which are not so easily measured. The morale of a nation, the quality, integrity and stability of a country’s political system and a nation’s sense of unity are all intangible elements. So is diplomatic skill, which is central to the ability of one country to influence another. 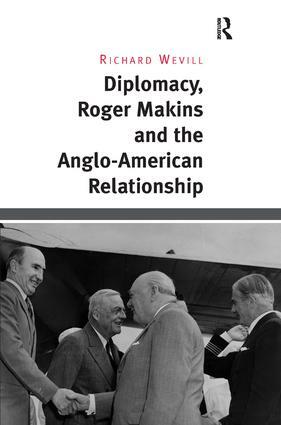 Roger Makins, the British Ambassador to Washington 1953-1956, was one of the most prominent and powerful diplomats of his time. His career was unusual for a Foreign Office official, in that such a large part of it took place in Washington and London, and was centred on Anglo-American relationships. This book describes his life, times and the important players he dealt with on both sides of the Atlantic. It is history seen through the perspective of the officials trying to serve their countries’ interests, and as such it sheds a new light on how the ’special relationship’ between Britain and America developed. It also shows the impact on policy a civil servant, who worked and negotiated with almost every important American and British politician and official of his time, can have. Richard Wevill turned to the study of history after a successful career in investment banking. Richard gained his PhD from the University of Exeter where he is currently a Research Fellow. Richard is also a Fellow of the Royal Historical Society. He is the author of Britain and America after World War II: Bilateral Relations and the Beginnings of the Cold War (2012). He is currently working on his next book which is concerned with the role of the Treasury and Treasury officials in Anglo-American relations 1945-1960.